Seasonal - Call 603-627-9278 for information. 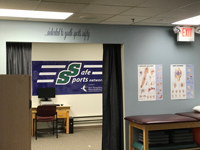 The Safe Sports Network was started in 1989 and now keeps student athletes safer at area high schools by providing on-site athletic trainers and operating a free sports injury clinic in Manchester, NH. Safe Sports provides emergency planning, concussion management and injury care to middle and high school athletes. The Safe Sports Network works to educate parents, athletes, administrators and coaches in areas of sports medicine and injury prevention. We also partner with youth leagues to provide emergency preparation consulting, concussion management programs, which include baseline testing and post injury management. The Safe Sports Network recognizes that without appropriate sports medicine care, potentially serious injuries may go unrecognized and result in unnecessary disability - or worse. Because of this, the Safe Sports Network is dedicated to promoting and providing a safe sports environment for athletes.